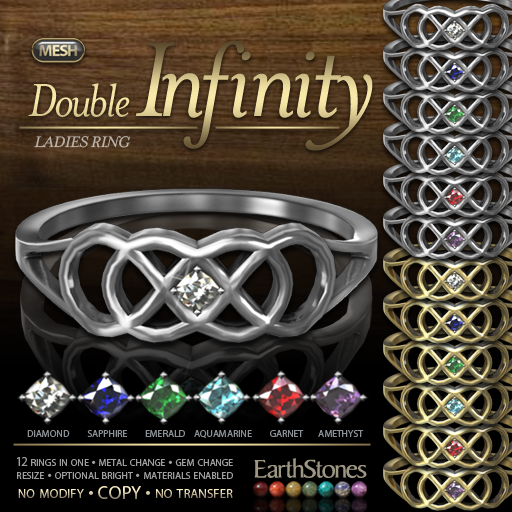 Lovely mesh rings featuring a double infinity symbol with gemstone accent. These make perfect Promise Rings, Friendship Rings, I Love You Rings, Just Because Rings, Pinky Rings, Sister Rings, Brother Rings, any kind of ring you can think of! Each is 12 rings in one, with silver and gold metals and 6 gorgeous realistic gemstones, plus full bright option and click to size, all in ultra low lag scripting. And of course you can wear it on either hand and any finger. 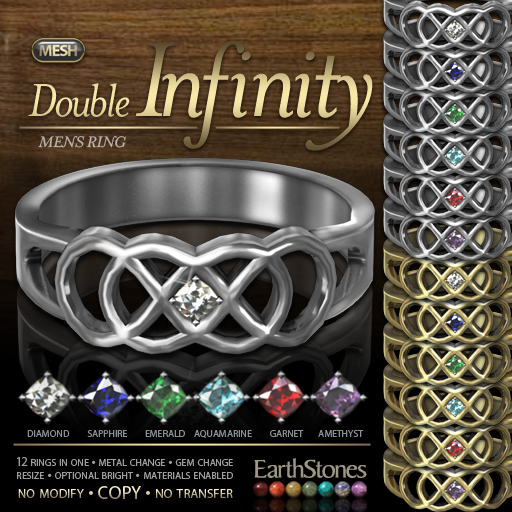 Rings are available in COPY or TRANSFER at the EarthStones main store and COPY ONLY on the marketplace.